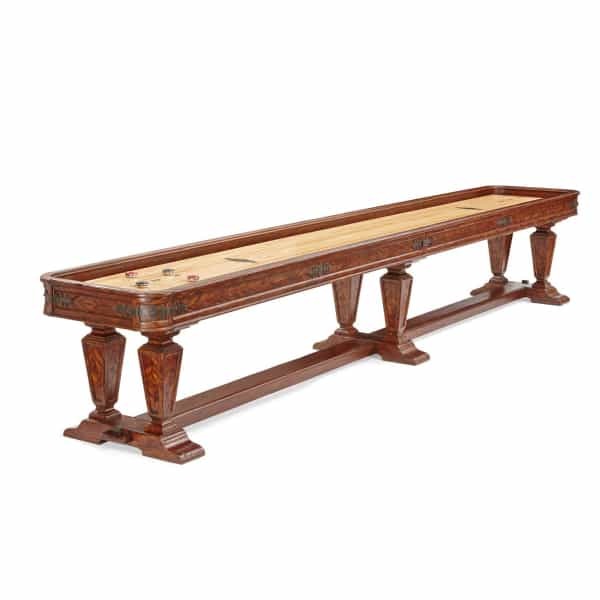 The 16’ Newbury Shuffleboard Table is one in a new lineup of Brunswick Billiards shuffleboard tables that achieve a striking balance between gaming functionality and artistic furniture. The cabinet is substantially sized, with unique design and finish plus ornate metal detailing throughout. Six legs feature impressive woodwork detailing and leg levelers, which keep the table sturdy on any flooring. The playing space matches the cabinet in quality, with its North American maple wood surface that is finished with the highest quality polymer resin surface. The surface ends up standing at 3 inches tall, with a slick finish or ideal playing. The playing surface is equipped with six climate adjusters for year-round performance and caretaking. Enjoy the complementary package of startup gaming materials, including four black pucks, four red pucks, a table brush, shuffleboard wax, and a stainless steel abacus scorer. Any game room has a billiards table, and you can shoot pool at the local bar. Are you ready to be the first of your friends to offer shuffleboard?